It seems like just yesterday most people associated DNA testing with detectives on CSI cracking cold cases, or scientists in Jurassic Park pulling dinosaur DNA from mosquitoes encased in prehistoric chunks of amber. Today, millions and millions of people are taking DNA tests in the privacy of their own homes, in order to gain insights into their ethnic makeup and the twisting roots of their family trees. The tests have actually become very popular holiday gifts, with Forbes reporting that AncestryDNA sold more than 1.5 million kits over Black Friday in 2017. That same article quoted a report that stated that the industry will grow to about $340 million by 2022, up from about $70 million in 2015. 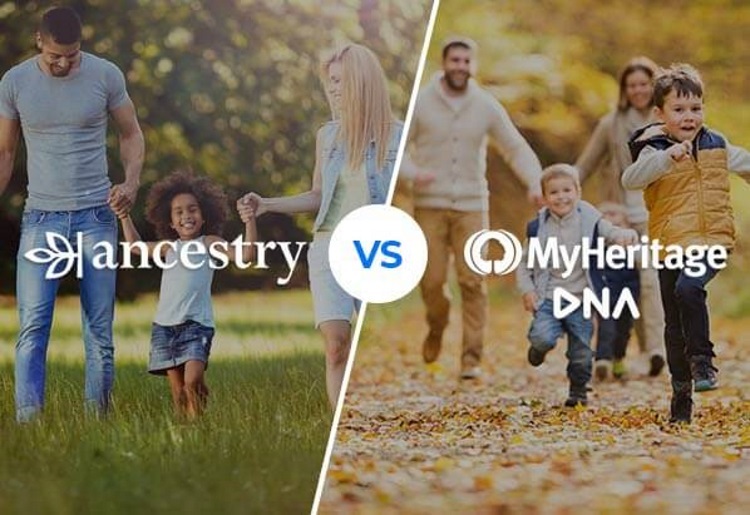 2 of the top companies in this industry are AncestryDNA and MyHeritageDNA, and in this article, we compare them side to side, to find out which offers the better product to people trying to solve the mystery of who they are. The world’s most successful genealogy website, Ancestry.com, has entered the DNA home testing kit industry with AncestryDNA. The DNA service is a great resource for anyone looking to learn more about their background, and the service makes use of Ancestry’s database of more than 6 million users and over 17 billion searchable records. The service is easy to use, affordable, and provides you with an educational look at your family history, which can be traced through 350 unique geographic regions worldwide. MyHeritageDNA is another major player in the online genealogy world. The company’s database of billions of historical documents and photographs has helped users create millions of family trees. In 2016, the company launched MyHeritage DNA,one of the most comprehensive, affordable, and easy to use kits on the market. AncestryDNA digs deep into your genetic history and maps the roots of your family tree across as many 350 or more regions around the world. The science can even pinpoint these family pitstops to regions as small as specific counties or cities in Europe as well as wider areas like Central Africa or South Asia. Your family’s wanderings can be traced through the company’s “migration stories,” which helps provide some of the details for the “new ancestor stories” tool, and that can be used to potentially find unknown relatives. In addition, the company can plug your genetic information into its database and possibly find user matches you’re related to. Another feature of AncestryDNA is the fact that it’s run by Ancestry.com, the world’s largest for-profit genealogy company. The company’s databases include more than 17 billion searchable records, so if you’re working on a a family research project, you can add a membership to the company’s genealogy database and really go deep. The company also offers users a free mobile app. MyHeritage, on the other hand, provides an interactive, easy-to-use and highly informative DNA test that can truly shed light on you and your family’s history. Your MyHeritage report will give you a percentage-based estimate on your ethnicity, which is “revealed” with a fun video that combines great graphics and music specific to each region included in your results. There is a total of 42 ethnic regions that the tests cover, including some that are unique to MyHeritage. Like with AncestryDNA, on MyHeritage you can pay extra to access the company’s billions of genealogical records from across the world, including the “BillionGraves” database, which includes vital records and other documents from across the world. Both companies provide a wealth of family history information tracing back far into the past, and we definitely liked the fact that MyHeritage lets you upload your information from other testing services. Nonetheless, we’re giving the nod to AncestryDNA for its more extensive and detailed regional mapping and family migration history. MyHeritage has some of the lowest prices on the market, with the DNA kit regularly featured at the discount price of $59-$69 (marked down from $99). Shipping and handling costs $12 per kit, and the company doesn’t list any discounts on shipping after the first kit. An annual subscription to MyHeritage family tree resource costs $110 per year for the premium version, $175 for premium plus, and $250.80 per year for the complete package. On AncestryDNA, the autosomal DNA test costs just $99 and it’s often on sale for $79 or $69. Shipping is $9.95 and $4.95 for each additional kit. Access to AncestryDNA genealogy records can be added for $19.99 per month, and if you add in international records, it climbs to $34.99. The price difference on the kits isn’t dramatic, but we gave the edge to MyHeritage because of the lower bottom line. Also, when bought annually, a membership to the company’s historical records is cheaper than joining AncestryDNA’s genealogy records service for a year. AncestryDNA advertises a quick turnaround on kits - saying that users can expect to receive the kits within a few days of ordering and that after returning the sample, they can expect results within 6-8 weeks of the time the company receives them. MyHeritage kits should arrive at your house about a week and a half after you place your order. After sending the test off to the lab, you can expect your results in 4-6 weeks, at which point they can be reviewed on the company’s secure website. MyHeritage offers a slightly quicker turnaround on results. Whichever company you pick, you should expect results to take a little longer during holiday season, when these tests are a popular stocking stuffer and the labs can get backed up a bit. Your report is quite easy to understand and navigate on AncestryDNA, after you’ve registered online. You simply click on the toolbar on the website that says “DNA results summary,” and once inside, you can track the status of your test. Once the status reads “done,” you can easily explore the interactive results, including the color-coded ethnicity map. You will also be presented with “predictive relationships,” including everything from 1st to 3rd cousins and beyond, and a breakdown of the likelihood that you found a new relative on AncestryDNA. At any time you can click on helpful links that can take you to further explanations of the results and what it all means. On MyHeritage you can track your DNA kit’s status online through the company website and then when it’s online, you can enjoy a report that is easy to navigate and understand. Part of the fun of the MyHeritage kit is the interactive globe that shows you the breakdown of your ethnicity. The globe spins and shows you different-colored blobs over each region of ethnicity in your DNA, while playing an instrumental tune native to each region. When you extend the reviews and get the full breakdown, you can see possible DNA matches listed by name, and how they may be linked to you. Both companies do a great job of making the results easy to understand, while also interactive and fun. AncestryDNA has a database to be envied by anyone in the industry - with more than 5 million users by August of last year. MyHeritage still has a relatively small database of over 1 million. It’s growing quickly, but still far behind AncestryDNA. The database for AncestryDNA is simply much larger. Both AncestryDNA and MyHeritage DNA offer well-rounded, easy-to-use DNA testing kits that are affordable and provide great insights into your ethnic makeup and the history of your ancestors. There’s certainly a lot to love about MyHeritage - included that the company allows you to upload your DNA data from other testing services - but we gave the win to AncestryDNA because of its more extensive features and database. Whichever DNA kit you choose, you can be confident that you’ll receive all types of details about your family history, and perhaps even a few surprises.